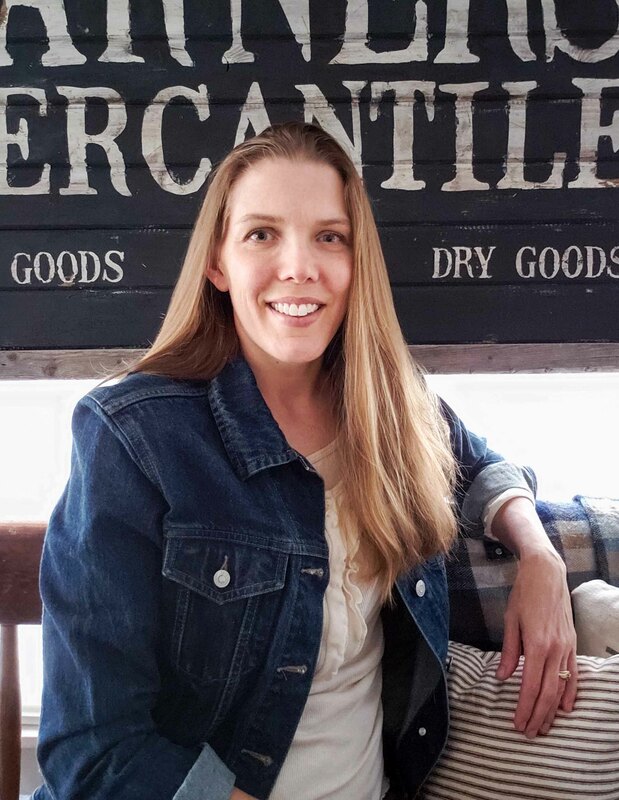 I’m all about DIY and certainly saving a penny or two, but can you believe this rustic farmhouse bench was made for less than $20?! 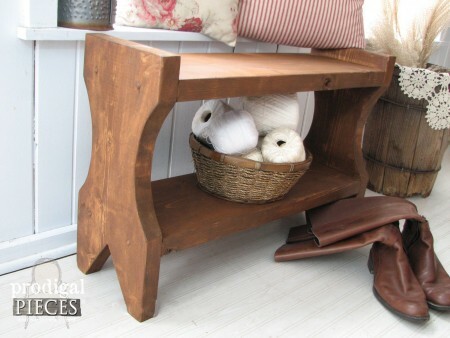 Today, I’ve got a sweet tutorial for you on how to build this farmhouse bench, and how to finish it in two different ways. 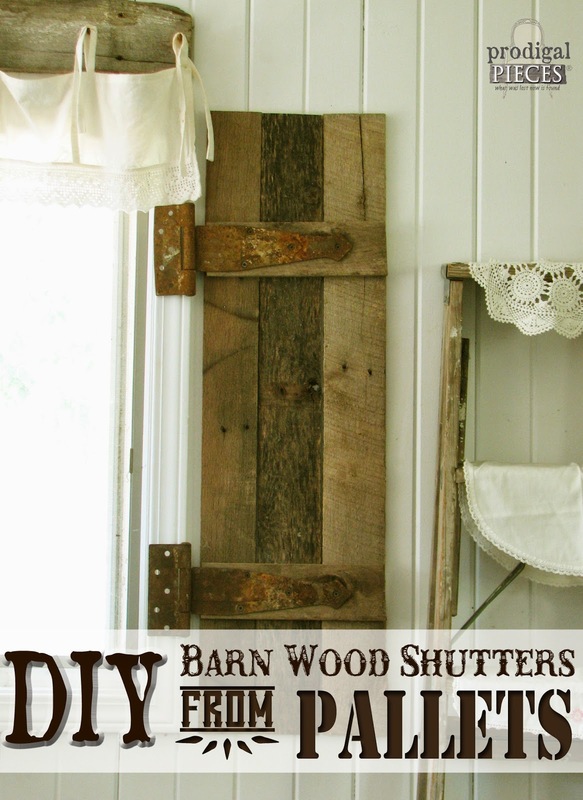 Since I live in the heart of farm country where reclaimed barn wood abounds, it’s easy for me to locate some old barn wood. 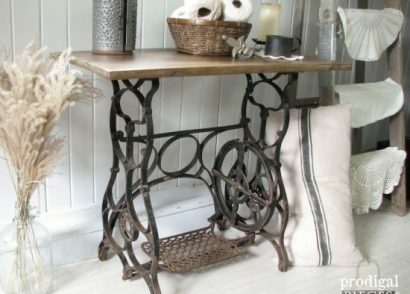 However, for most of you, that resource isn’t always available and you desire to add the farmhouse look to your home. 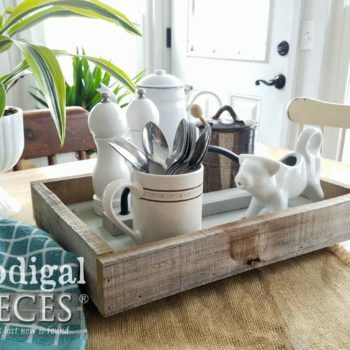 So, for fun, my hubby and I are going to show you how to take your typical box store pine and turn it into a rustic and functional farmhouse style bench that can be placed in your entry, mudroom, bedroom…the possibilities are endless! To begin, we’re using a 2″ x 12″ x 8′ pine board that you can locate at most any Home Improvement store, and typically only costs about $10. TIP: When you’re purchasing your wood, don’t just grab the first board you see. Take a second and pull it out. Look for splits, warping, too many knots, etc. Be selective so that you get what you pay for. 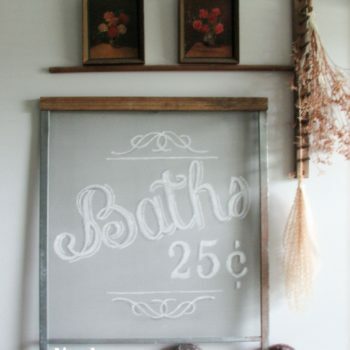 Let’s get our DIY on! The design of this bench requires that the seat/shelf be a tongue & groove design to add extra durability, so those boards are actually cut longer initially because they will be inset to the side supports. 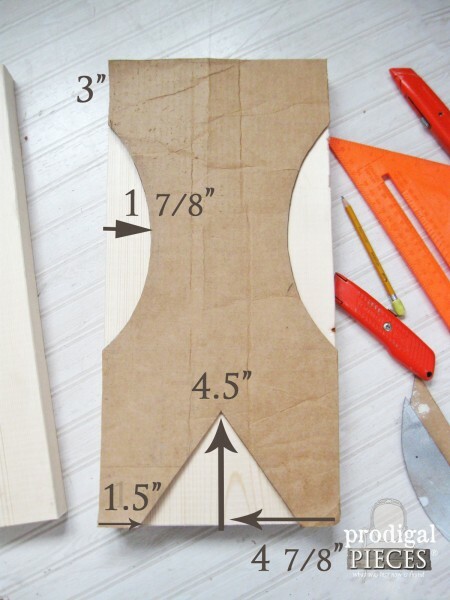 Once you’ve cut your boards to length, you’ll want to take one of the 19″ boards and trace the outline on a piece of cardboard (or paperboard, or piece of paper). 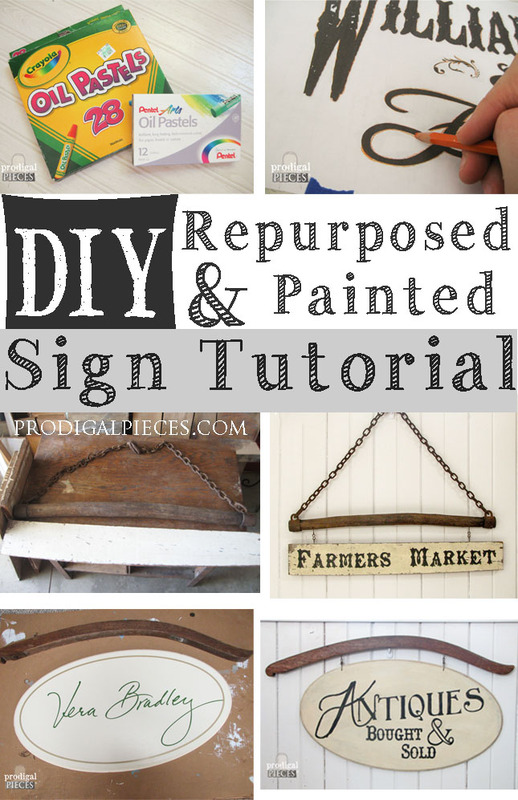 To create those cut-out sides I used a thrifted oval picture frame (11″ x 9 1/4″), but really you could use any shape or object you like (a bowl or other round object), or even omit the cut-out all together because this feature is more for asthetics than anything. (note: removing that cut will change the layout of the assembly). 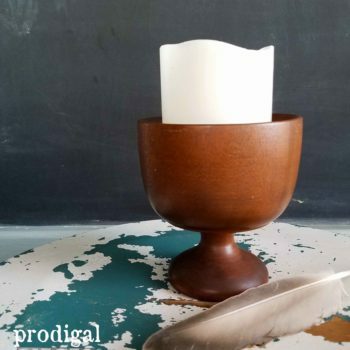 Just lay the oval shape 3″ down from the top edge and about 1 7/8″ in from the edge. Next, you’ll want to make the triangular cut-out from the bottom. Find the center of the bottom of the stencil at 4 5/8″ and mark. From the center mark, measure 4.5″ up and mark. Measure 1.5″in from the bottom corners and mark. Using your square, connect the corner marks to the centered mark. Now, take your stencil and lay it on your board and trace on both sides. I trace on both sides because when using a jig saw, sometimes it can cut a bit wonky when working on a thick board. Having the opposing tracing can help line things up if you need to flip it and tweak the cuts. 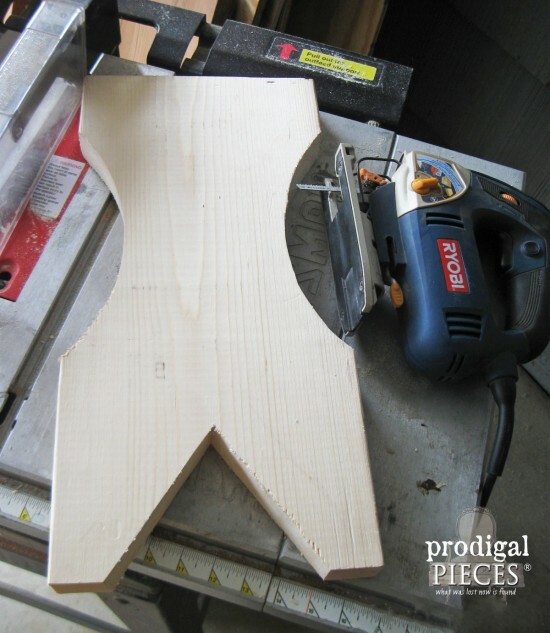 Next, grab your jig saw and cut out the traced shapes. (Be sure to use protective eyewear!) 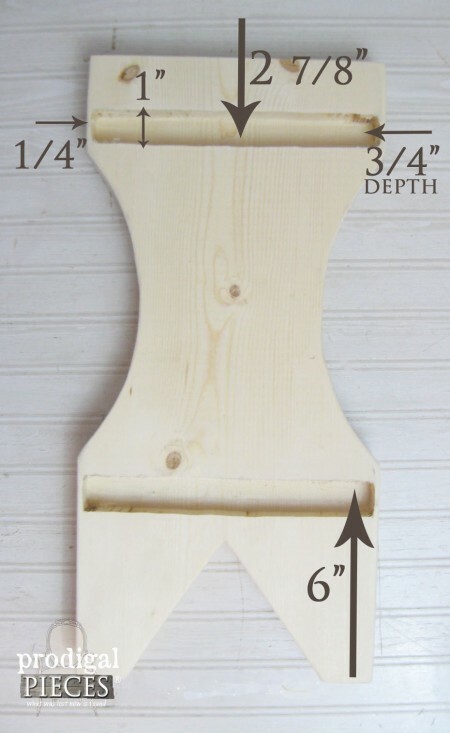 If you have a band saw that would be slightly easier, but a standard jig saw will do the job. Now you’ve got your rough cut end pieces and it’s time to sand. Yay! 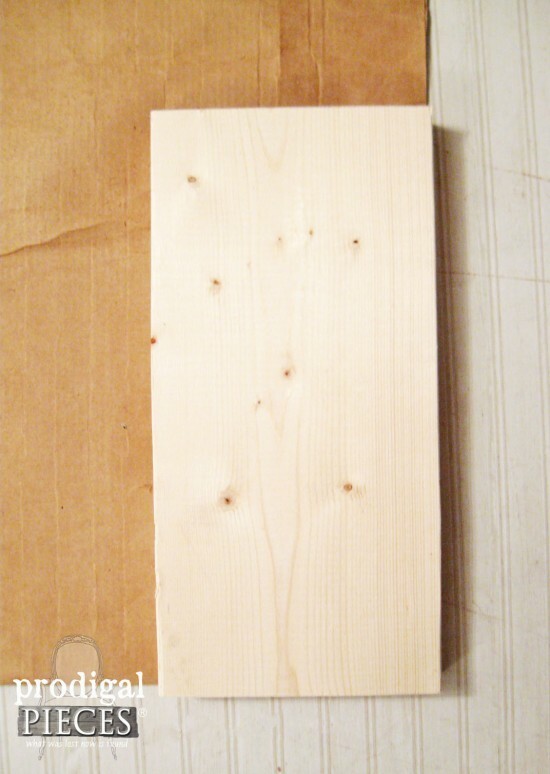 Because pine is a soft wood and I’m going for a rustic appeal, I only use a 150 grit sandpaper, but typically with a hardwood I would start out at a 120 grit and work up to a 220 grit or higher for a fine finish. Having fun yet? I am! Tools over jewels I say. tsk. Time to head over to the table saw to create a tongue on the seat and shelf. Set your blade to 1/4″ height and your rail to 5/8″. *Explanation: We are wanting a tongue depth of 3/4″, so to achieve that your rail is set to 5/8″ and then you add the width of the blade, which is 1/8″ – those added together give you the correct 3/4″ depth. 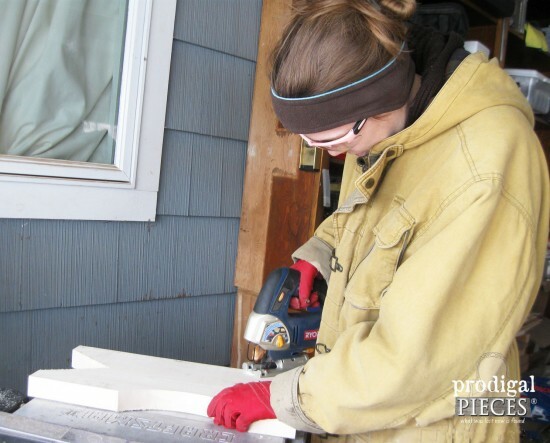 We used a standard blade, but a dado blade would be preferred if you have it – we wanted to show you that you don’t need tons of specific tools. Use several passes to “chew” away the wood. You will need to do this to all four sides. 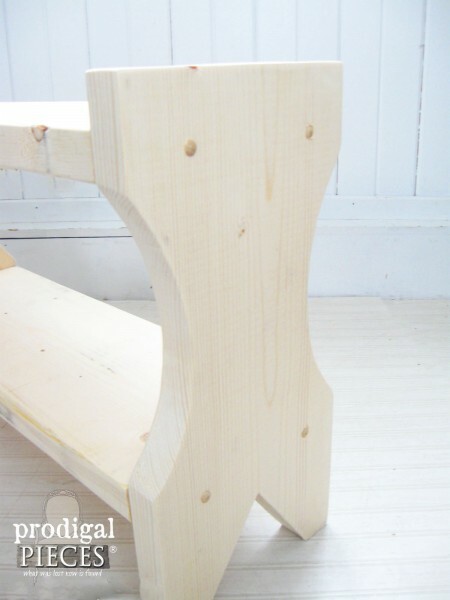 In order for the tongue we just created to work in our farmhouse bench, we need to create a groove for it to go into. 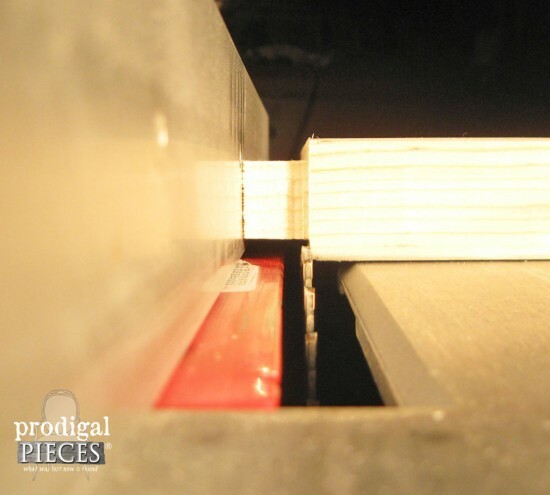 On our side pieces, we’re going to measure 2 7/8″ down from the top on both sides and mark across, stopping 1/4″ from the edge. 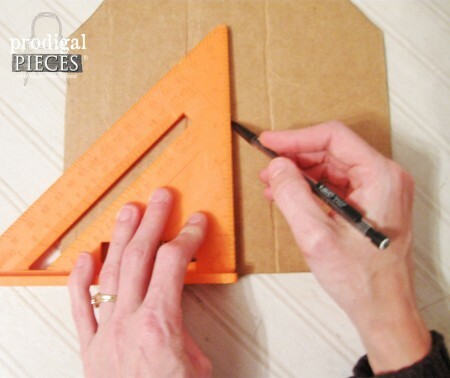 Next, draw another line 1″ above the first line to create a box. 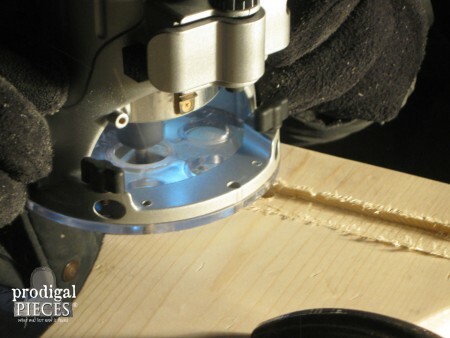 With your router, you will want to make several passes to hollow out a notch 3/4″ deep – which is where the tongue is going to go into. 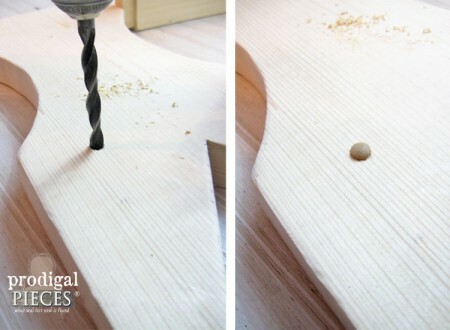 When finished, lightly hand sand the edges to get a clean edge. Don’t you love that we have to work at night here in the buckeye state? Brrr…. You’ve cut, sanded, and routed, and now it’s time to assemble. 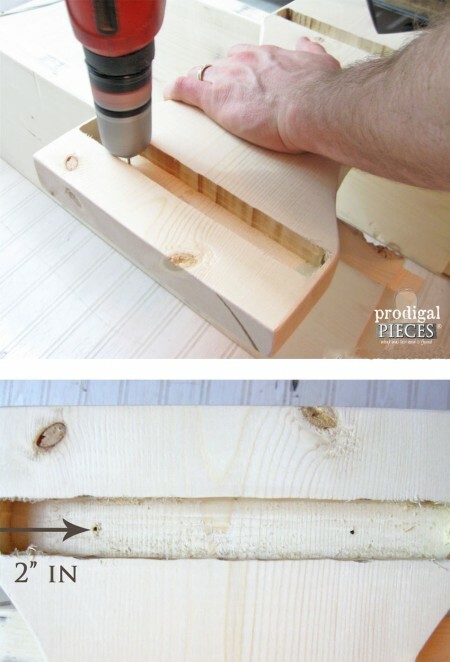 Next, flip the side over and using a 3/8″ drill bit, you’re going to create a counter-sunk hole so that your screw head will rest below the surface and create room for the wood plug to rest. Be light on drilling so you don’t go too deep. 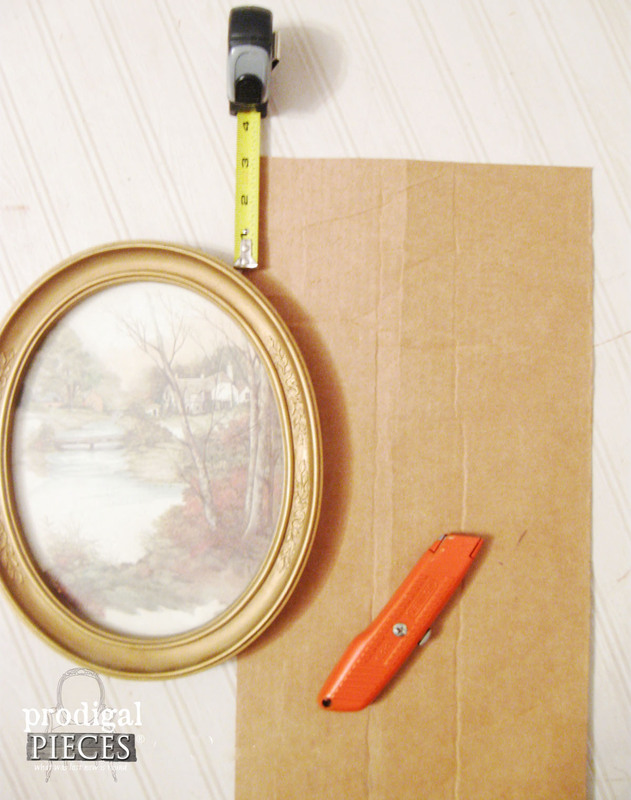 As a precaution, you can even put tape on your bit about 1/4″ from the end to be a depth gauge. When you’re woodworking, it’s always good to do a dry fit to make sure all pieces fit together and are snug. 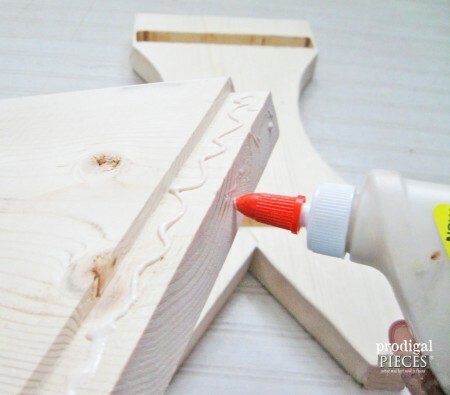 Once you’re sure it all fits nicely together, apply wood glue to the tongue as well as inside the notch. 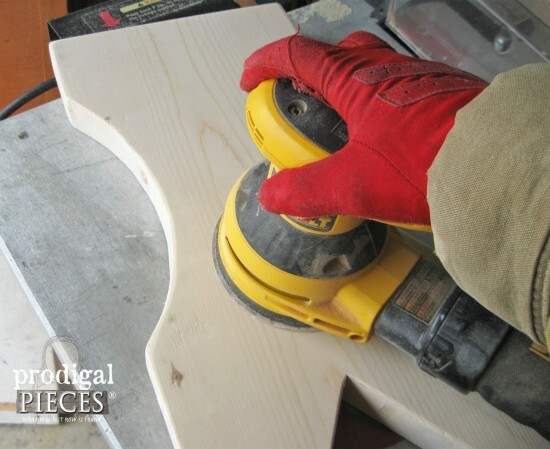 Lay the side piece on the floor and then insert the seat & shelf into the notches. Then add the other end piece to the top, making sure to add glue to the tongues and notches. 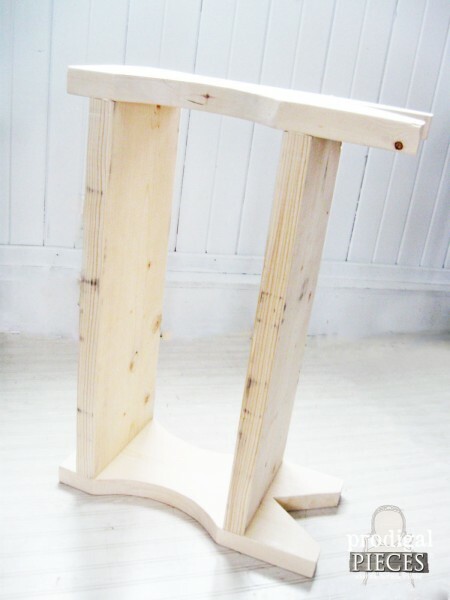 While the farmhouse bench is still on its side, secure it together with the screws. Add the wood caps to finish it off and then the build of this farmhouse bench is done. It’s best to let it dry overnight, but a couple of hours should suffice since the screws are holding it in place. From here you can make it whatever style you like, and as an example I’ve taken the same bench and given it two different finishes. 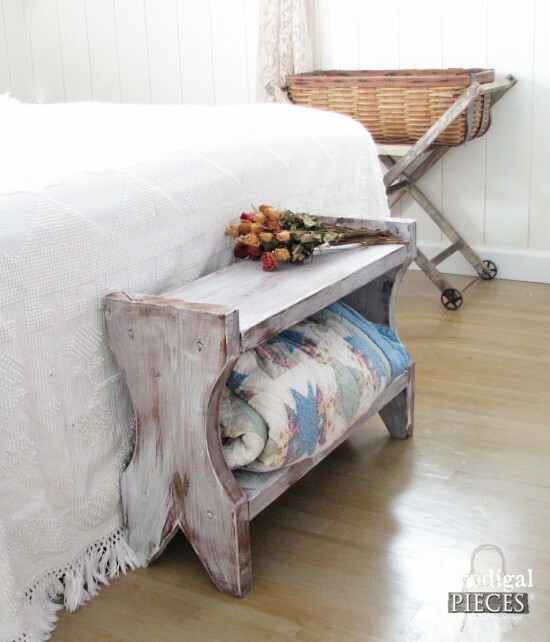 A rustic style with stained finish using my favorite Varathane Early American stain . I’m lovin’ the extra storage below for boots, hats, gloves…whatever. 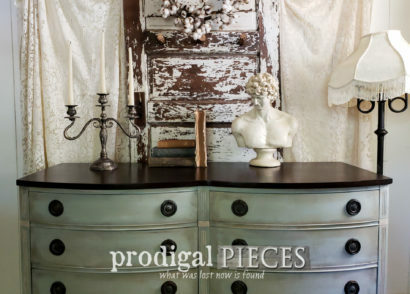 Or maybe your taste is more of a shabby chic, cottage style, and you prefer a distressed time-worn look with a whitewashed effect. For this variation, I stained as before, but this time I used my cheapo flat ceiling paint to add a washed layer. 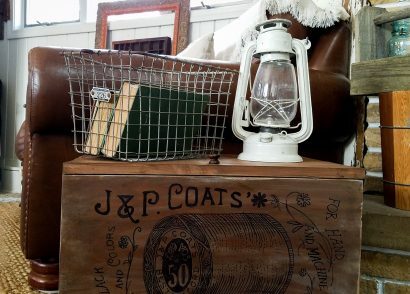 Both will look fantastic in your cottage, shabby chic, or farmhouse style decor. 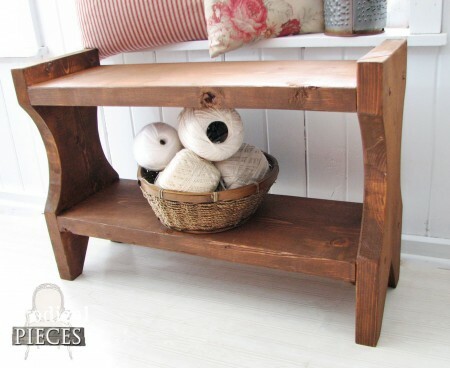 You can even paint this farmhouse bench solid with a gloss finish for a modern twist. Have fun and make it your own. Making your home your own shouldn’t make you broke! All it takes is desire and a DIY attitude. Got questions? Just let me know and I’ll be more than happy to help. Don’t want to build, but want the bench? We will create a custom piece for you, just head to my shop. Pin away if you love this project too! LOVE, LOVE, LOVE this! Can’t wait to make one! Fabulous bench Larissa and awesome tutorial. Pinning this for future reference because this girl is making one or two of these! I love this! The shape of the sized is gorgeous! Great tutorial for a great piece. Love that you showed us show many details and pics to follow along. I think I’ll get my hubby to help me make one for our daughter who just moved in her first house. There are so many places she could use it. Thank you, Patti. 🙂 Yes, it is very versatile and when you make one I’d love to see it! 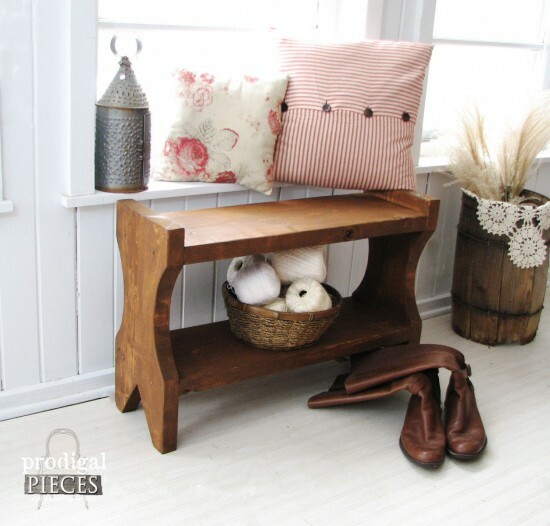 Absolutely love this bench- adding it to my ever growing “to-do” list! I’m not sure what i would do first. Curious though…can you also use paint in this sprayer? Absolutely. Perfect for painting an outdoor paint.